Full of explosive pyrotechnics, larger than life costumes and plenty of tongue wagging, KISS are truly going out with a bang! Here are just a few highlights from the US leg of the farewell tour. Including all your favourite hits, the US set is 20-tracks long, featuring "Detroit Rock City," "Shout It Out Loud," "Say Yeah" and "Calling Dr. Love." 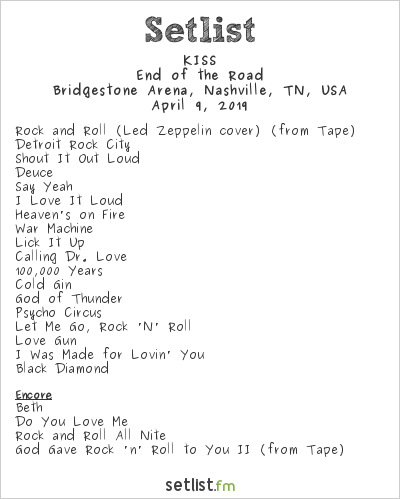 The show's conclusion usually features four songs, concluding with a tape of "God Gave Rock 'n' Roll to You II." With so many original hits, the band only does a snippet of The Who's "Won't Get Fooled Again" during a rendition of "Lick It Up." The stage is filled with fiery crescendos, smoke machines and thunderous instrumental sets. The most exciting bit? Paul Stanley soaring just a few feet above the crowd! KISS Army: Stand Up! Four UK Arena Dates Confirmed For 2017 The fearsome four head to London, Birmingham, Manchester and Glasgow in May. KISS Donate Signed Guitar To Children's Hospital Following Manchester Attack The guitar will be auctioned off to raise funds for the hospital's intensive care unit.